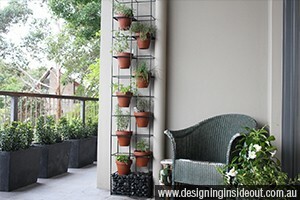 Create a functional herb wall with this wireframe stand. All pots and frame can be moved and changed when needed. With limited space being a big issue in new developments, gardens are usually the last thing considered, but a good garden design is necessary for your own enjoyment, no matter what size the available space. If you have only a small space for a garden or even if you are renting, then you still can create an oasis or enjoy herbs and veggies by bringing in some functional planter pots to create a moveable garden. There are many styles to choose from and the light weight pots are fantastic for balconies or if you know you may need to move and don’t want to leave the plant behind. Do the plants need shelter from the hot summer sun? Do they need access to the sun in winter? Do they need protection from winter frosts? Would they benefit from being under shelter? Would they benefit from being moved into a more open space when it’s raining? One ideal solution for your movable garden is to choose modern, lightweight pots that give you the flexibility to move the pots easily, which means that the plants can be positioned closer to the walls in winter, protecting them from any strong winter winds or even under cover to protect them from frosts, as well as being able to position your plants to receive more sun when needed for growing herbs and vegetables. 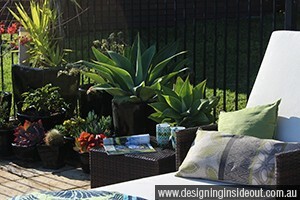 Group pots the same colour and creating interest by using different textured and coloured foliage. Use good quality potting mix – plants need the correct nutrients to survive. Water regularly and make sure the pot drains well – if not well drained, then roots are susceptible to root rot. Use a suitable slow release fertiliser – this gives the plant food when it needs it. Don’t overcrowd pots – all plants need their own root space to be able to grow larger. Group pots together to make a focal point – use colourful pots or different foliage textures. Ready to create your own stylish, moveable garden? So have a go now at creating your own movable garden so you can enjoy your balcony or other small space to grow herbs or some beautiful potted colour with amazing annuals now available at low prices.